This fruit basket has 16-18 pieces of FRESH Extra Fancy US #1 Fruit. 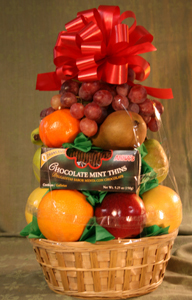 It is topped off with a big bunch grapes and comes with a box of gourmet cookies. Perfect as a housewarming gift or a present for your granny.